Home Entertainment COMEDY & CULTURE – An evening of Music, Dance & Laughter! COMEDY & CULTURE – An evening of Music, Dance & Laughter! 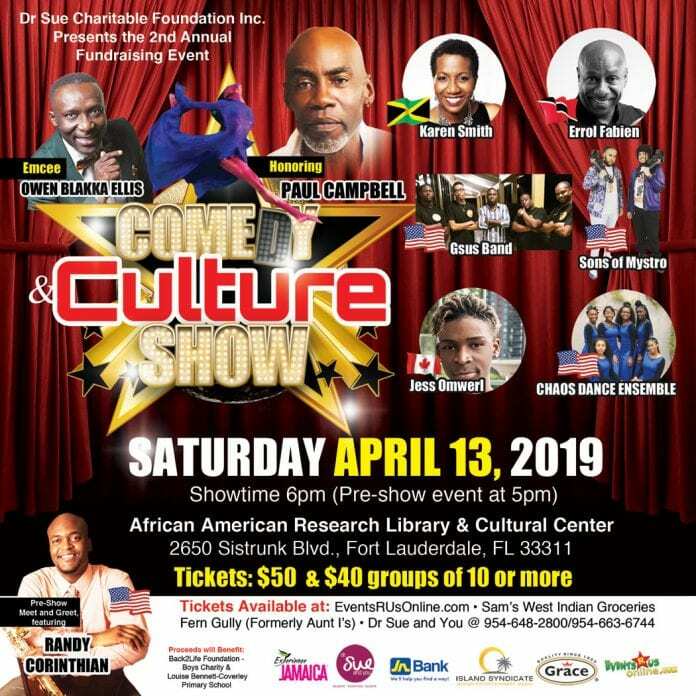 The Dr Sue and You Charitable Foundation Inc., will be hosting their 2nd annual evening of Comedy and Culture Saturday, April 13, 2019 at the THE AFRICAN AMERICAN RESEARCH LIBRARY & CULTURAL CENTER, 2650 Sistrunk Blvd Fort Lauderdale, Florida. In addition to delivering a scintillating evening of top class entertainment and providing a forum to showcase the very best of Caribbean culture in the diaspora, the event will honor legendary Jamaican film actor and visual artist PAUL CAMPBELL. It is also a fundraising effort, as proceeds will benefits the Library at Louise Bennett Coverley All-Age School and the Back2Life Foundation mentorship programme for boys.. The evening’s event is sponsored by: Jamaica National Bank, Jamaica Tourist Board, Island Syndicate, EventsRUsOnline.com, PMMP Promotions, GRACE and the Friends of the African American Research Library & Cultural Center.